The Packers claimed outside linebacker Chis Odom off waivers from Atlanta on Sunday, essentially to take the place of Jayrone Elliott, who was traded to Dallas earlier in the day. So what is the defense getting in the undrafted free agent from Arkansas State? I watched all four of his preseason games in an effort to find out. 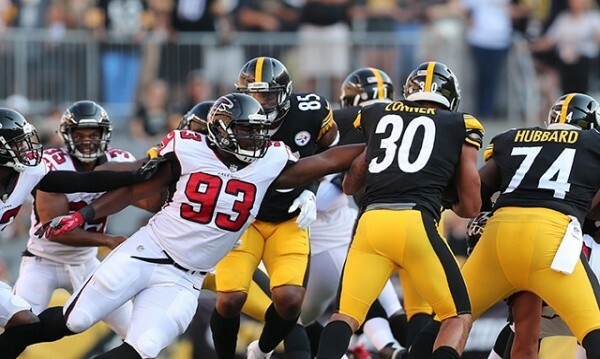 Odom played well for the Falcons this summer. He was a disruptive force against the run and had two sacks. But he did all of that with his hand in the dirt, and that’s not how he’ll be used in Green Bay. At 262 pounds, Odom’s not big or strong enough to play end in a 3-4. Whether he’s athletic enough to be a good outside linebacker is the question. That’s hard to predict without seeing him at the position, but my initial inclination is to be skeptical. Odom moves around on tape like Mike Neal and Datone Jones, another pair of college 4-3 ends who transitioned to outside linebacker with the Packers. By that I mean he’s an above average athlete for a defensive lineman, but probably doesn’t possess the skill set to be anything more than a JAG (just another guy) standing up. 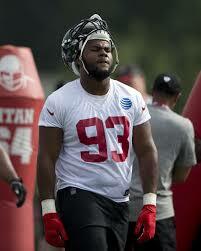 Against the run, Odom (#93) should be just fine in the National Football League. He has enough point-of-attack strength to hold the edge, and he uses his hands well to disengage from blockers, find the ball and make the tackle. 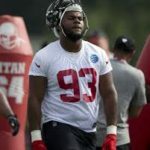 As a pass rusher, Odom had some success beating backup tackles off the edge during the preseason, but again, that was with his hand in the grass and against players who will either be on the bench or in another line of work come Sundays in the fall. I just don’t see the quick first step or the explosiveness needed to have similar success against starting caliber tackles. Those were issues for Neal and Jones as well. The best, and probably the only chance Odom has of contributing this season is as an inside pass rusher in the nickel and dime packages. His size will be an issue against players who outweigh him by 40 or 50 pounds, but he might be just athletic enough to give pedestrian guards and centers some problems. Odom uses his hands effectively, never stops working to come free and has an above average closing burst. The verdict? Considering how rarely Thompson claims a player after final cuts – only twice since 2007 – I was expecting to be a little more impressed. Is Odom an upgrade from Elliott? He probably won’t be this season and he may never be. On the other hand, he’s younger, cheaper and at least has the potential to improve – something Elliott hadn’t really done since bursting onto the scene with 5 sacks in the summer of 2014.